My favourite viewpoint doesn't have a name but can be seen from a local Bogoda situated on the central western side of the island (near Sairee Beach). Unfortunately trying to direct you to one of the less well known viewpoints is a little difficult, but Google Maps knows where Koh Tao Crossfit is (random much), so head up that road past the Crossfit until you come across a dirt road on your right hand side and follow this all the way until you come across some stairs heading up the side of the mountain (ask the locals if you're not sure!). The viewpoint is initially accessible by road or by quite an intense short hike. Depending on your fitness level you might want to take a taxi up to the highest point and walk from there as it is quite a steep, rocky climb (but completely worth it!). From the top of the viewpoint you can look out over the vast mountains and forests, down to the bay and the glistening ocean. A pretty incredible sight, just make sure you take lots of water!! There are plenty of other viewpoints all over Koh Tao, each offering a different yet incredible overview of the untouched beauty of the island. Be sure to take at least one adventure trek while you are staying in Koh Tao, you won't regret it! Snorkelling anywhere in Koh Tao is amazing, but I particularly enjoyed swimming over the coral reef at Koh Nang Yuan. There is an abundance of tropical fish to be seen which are clearly used to human presence as they happily swim around you. The water is also amazingly clear, allowing you to really see and experience the reef and sealife it houses. The bay itself is calm and serene, so even the most inexperienced swimmers would feel comfortable. There is picturesque scenery around you in every direction, with the sandbank a real holiday fantasy with its umbrellas and deckchairs. 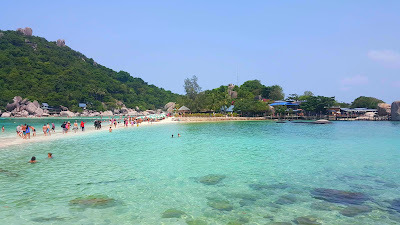 Koh Nang Yuan is very popular with families, and has a secluded resort for those who wish to escape the mainland and stay in this gorgeous grotto location. If you fancy spending the day here there is also a lovely restaurant with reasonably priced food. There is also supposed to be an amazing view from the islands hilltop viewpoint, however it was sadly closed when I visited (just something else for next time!). 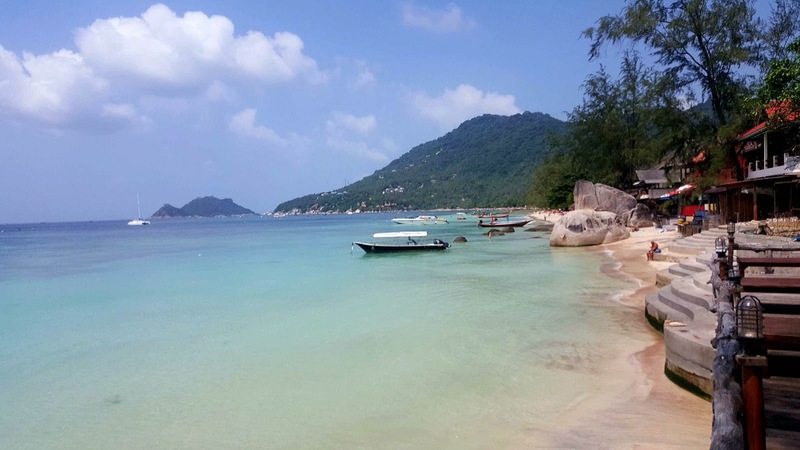 Getting to Koh Nang Yuan is easy, either via a water taxi, as part of a day cruise or with a snorkelling tour. So many options to visit this stunning little island! 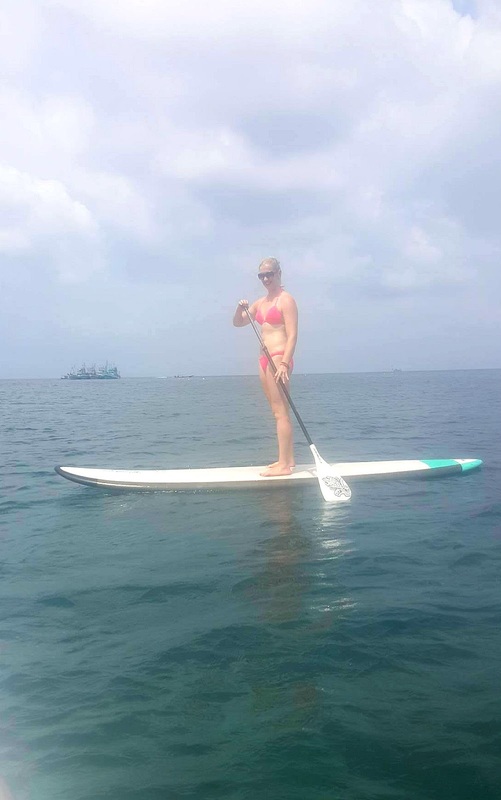 Definitely the most relaxing thing I tried whilst staying on Koh Tao was stand up paddleboarding. The freedom of being out on the ocean just soaking up the sun and being able to enjoy the island's beauty from just offshore. For a first timer I did struggle, but the calm waters made it easy to pick up. After a few laps of the coastline we tried some paddleboard yoga (with little success) and proceeded to just lounge about and float in paradise. There are a few places along the beach to hire boards from, price according to time (i.e. we paid 250baht for 1 hour). I'd highly recommend this for any adults who have some time spare, as it is something totally different, and a whole new way to view and experience Koh Tao! For the party animals out there, I bring you South-East Asia's largest pub crawl! Starting at Choppers Bar (along Sairee Beach), the pub crawl features a pool party, lady-boy show, as well as buckets of alcohol! With prizes, free drinks and games all night long, you're sure to have an amazing night out and make lots of new drinking buddies! Be sure to wear bathers so you can enjoy the pool party (by far my favourite part) and to protect you in case you "accidentally" fall in. Waterproof phone cases are also a good idea, but ideally this is one night you should leave the phone at home... The lady boy show is also an amazing experience, with entertainment and comedy to keep your drunken self entertained. Be warned though, you might get pulled on stage if you sit too close or you simply have really awful friends! The cost of your ticket gets you a pub crawl shirt, a free bucket at the first bar, a free shot at the second if you jump in the pool and all night happy hour drink prices! The pub crawl runs every Monday, Wednesday, Friday and Sunday night from 6pm and for 400 baht it's well worth it for a great night out! Don't try this unless you are fully aware of the risks, as cliff diving is obviously dangerous, but if you're up for a thrill Tanote's rock is there to be tackled! On a nice day with clam waters you can swim out to the rock, climb the sketchy rope to the top and take a giant leap of faith! Make sure you commit to jumping before making the climb as it is quite unsafe to climb back down. If the weather isn't perfect I also wouldn't recommend it as the waters can throw you against the rocks and cause serious injury. If I've scared you off the cliff diving you can still snorkel the bay or enjoy the seclusion of the hidden beach away from the crows. There's also a lovely restaurant on the beach front to sit back and enjoy some proper Thai food while soaking up Tanote's charm. 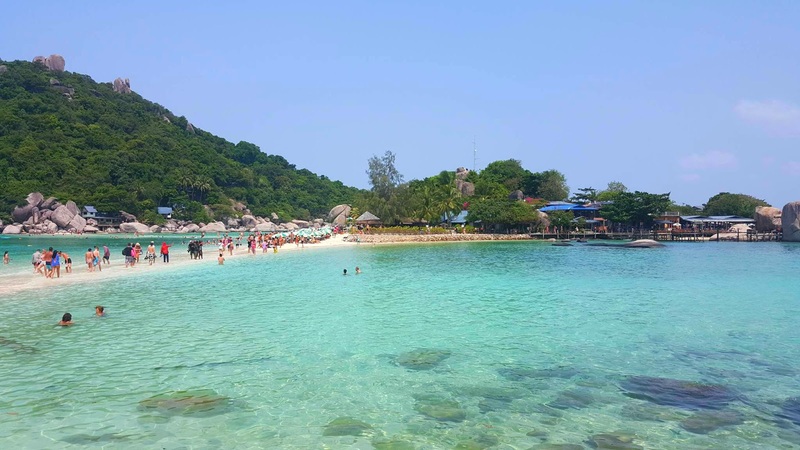 There is so much to see and do whilst staying on Koh Tao, but these would be my top 5 recommendations! This is definitely a place I will return to one day, as it truly captured the islander within me and has really drawn me in. Didn't want to leave so I'll be back soon! Beautiful photos and great recommendations!! 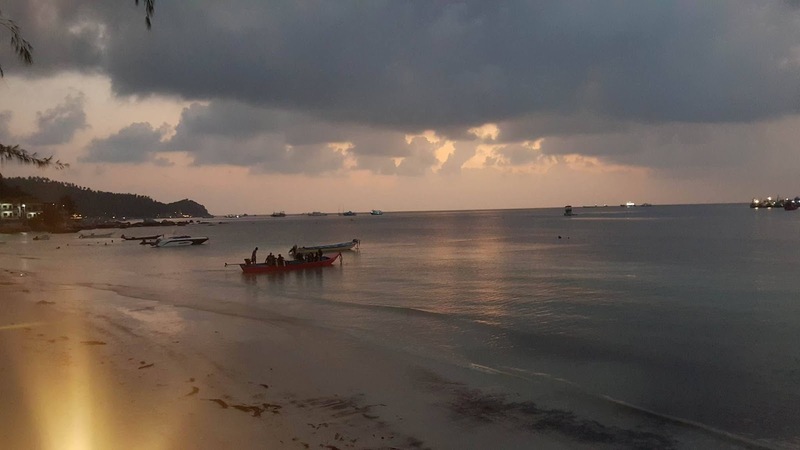 I loved Koh Tao so much!